Walter Ziegler's father Albert H. Ziegler was born in 1849 in South Whitehall Township, Lehigh County, PA. 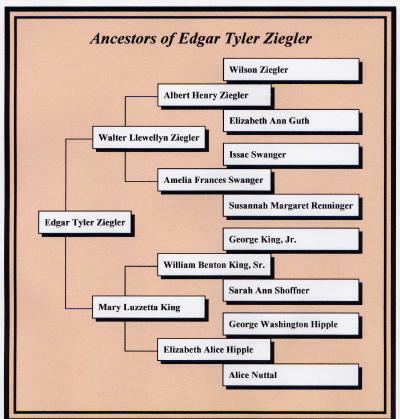 He was the first of two sons born to Wilson and Elizabeth Ann (Guth) Ziegler. He was christened at Jordon Reformed Church. Apparently Wilson died sometime after the birth of their second son Clayton and prior to the 1860 census. Albert was living with his Grandfather, Henry Guth, in the 1860 census. By 1879 Albert had migrated to Snyder County, PA, where he married Amelia F. Swanger. Albert worked for many years in the iron mills in Lehigh County, PA, Rockbridge County, VA and Chester County, PA. He died in 1921. Amelia Swanger was the daughter of Issac and Susannah Margaret (Renninger) Swanger. The Renninger family originally migrated to Montgomery County, PA in 1750. Susannah's great-grandfather, Johann Peter Renninger, migrated to Beaver Township, Snyder County (previously Northumberland County), PA around 1800. Duncan Renninger, a descendant of the Renninger family who remained in Montgomery County, later married my mom's aunt, Edythe Hedrick. Duncan and my dad were sixth cousins once removed, a fact that was never known until I started my research. Elizabeth Alice Hipple was the daughter of G. Washington and Alice (Nuttal) Hipple. She was born in 1865 in Phoenixville, PA. Washington was the Great-Grandson of Laurentz Hipple (orginally Hippel) who was born in 1728 in the Palentine, Germany. Laurentz emmigrated to Vincent Township, Chester County, PA at the age of 10 with his father Johannes Hipple. Laurentz owned land on the banks of the Schuykill River at what is now Royersford, PA (originally called Hippelsford until the land was sold to the Royer brothers). Washington worked in the cotton/wool mills in Phoenixville as an engineer. Around 1880 he migrated to Manayunk near Philadelphia where he continued to work in the mills until his death in 1921. He and Alice are buried in Morris Cemetery at Phoenixville, PA. Washington's father, John George Hipple owned and operated a cartage business in Phoenixville for many years prior to his death in 1886. He and his wife, Luzetta (Savage), are buried at the East Vincent Reformed Cemetery where many of the early Hipples are buried. Zetta King's father, William B. King, was born in East Pikeland Township, Chester County, PA in 1865. At the time of his birth his father George King, Jr. was operating the Kimberton Inn in Kimberton, PA and William was born there. He was the fifth of seven children born to George and Sarah Ann (Shoffner) King. For a time he operated a produce store in Phoenixville,PA. For many years he worked as a clerk in other stores in the Phoenixville area. He died in 1932 and is buried in Morris Cemetery in Phoenixville, PA.
George King was born in 1831 in Pikeland Township, Chester County, PA. He was the son of George and Catherine (Smith) King. He served in the 175th PA Infantry during the Civil War. He was 1st Sargent in Company C. Following the war, worked as a butcher and as operator of the Kimberton Inn in Kimberton, PA and the Phoenixville Hotel on the corner of Main and Bridge Streets in Phoenixville, PA. He died in 1902 and is buried in St. Peters Cemetery in Chester Springs, PA. This picture shows five generations of the Ziegler, King, Hipple, and Nuttal families. 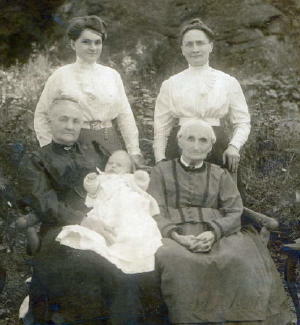 It was taken shortly after my father's birth in 1913 and shows his Grandmothers for 4 generations back. Clockwise from left rear: Zetta King/Ziegler, Elizabeth Hipple/King, Elizabeth unk/Nuttal, and Alice Nuttal/Hipple. The Nuttal family is unique in several ways. They are one of the few families among my ancestors who migrated to Southeast Pennsylvania in the 1800s and they are not of German origin. Alice Nuttal, the daughter of Robert and Elizabeth Nuttal, was born in England in 1846. Her father migrated to Manayunk, PA to work as a weaver in the cotton mills. Alice and her brother migrated with them. By the 1860 census, the family had moved to Phoenixville, PA where Robert was working as a loom boss in a cotton mill. Alice meet and married Washington Hipple in 1864. They had two daughters, Elizabeth and Mary Luzzetta. She died in 1930 while living in Manayunk, PA and is buried in Morris Cemetery in Phoenixville. Elizabeth Ann Guth was the first of six children born to Henry and Catherine (Hoffman) Guth. She was born in 1823 in South Whitehall Township, Lehigh County, PA. Henry was the grandson of Lorentz Guth, Sr. Lorentz was born in Germany sometime before 1720. He migrated to Pennsylvania and settled along the Jordon Creek in Northampton County (now Lehigh County), PA. He had already purchased some land prior to coming to Whitehall Township and made an additional purchase from William Penn to bring his total acreage to 1000 acres. He donated land to be used for building of the Jordon Reformed Church and cemetery. Henry was the son of Lorentz, Jr. and Anna Maria (Dorney) Guth. Henry served in the War of 1812 and received pension land in Whitehall Township. He later worked as a mason and a farmer. Later generations of these families also use the surname of Good. If you have questions or input on these families, please email me at mikez704@cox.net.